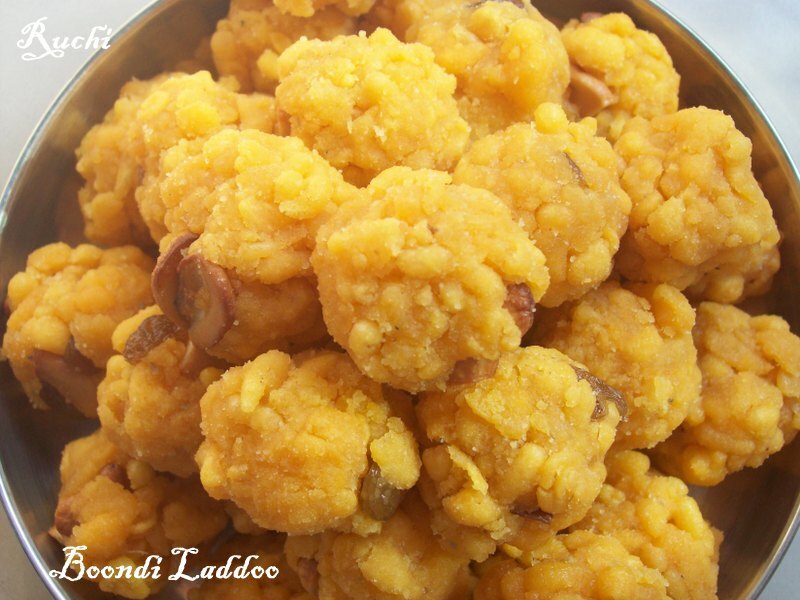 Boondi Laddu is a delicious Indian sweet make for special occasions and for festivals. Rich in name and taste as well this is surely a treat for your taste. Yesterday I made these Boondi ladoos as prasad! 2.Add the cardamom powder and 1/2 pinch saffron powder to the syrup and mix well. 4. Heat oil in a pan on a high flame and the oil should be very hot. 5.To test the temperature of oil just drops a pinch of batter. If it rises immediately the oil is ready for making the boondis. 6.Take a skimmer, Place it above the pan. Pour a ladle full of batter and spread as you would spread dosa. 7.Slowly drop the boondis into the oil. Immediately reduce the flame to low. 8.Fry boondi for few sec. Remember that it should not become crispy. It should be cooked but soft. 9.Remove the boondi from the oil, drain and drop the boondi in the sugar syrup. Mix well. Repeat the procedure until the batter is over. 1o Heat 2 table spoons of ghee in a pan. Fry cashew nuts, dry grapes and lavang in ghee and add to the and add them to the laddu mixture. Allow the mixture cool for some time and big lemon size laddus. 11Mix well and leave to cool for 10 minutes.Now you can start making balls out of the soaked boondhis. 12.Towards end if you find it difficult, just heat on a low flame for 2 minutes stirring well. 13.Allow the Laddus to cool completely and store them in a air tight box. Damn attractive ladoos, beautifully done.